If you made one (or more) of these bow brooches to give as gifts, here's a fun way to package them up. Keep a heap handy as pressies for the female rellies, friends, day-care ladies, teachers, etcetera. In fact, you don't even have to use a picture of your child; it could be a picture of yourself, a cute puppy, or even Darth Vader (providing you aren't breaking any copyright laws. This is an exercise in making a nice gift while saving money, not being sued by George Lucas and losing your home). Firstly find a picture you want to use. This one will do. You might want to use a favourite photograph you already have, or take one especially for this project. 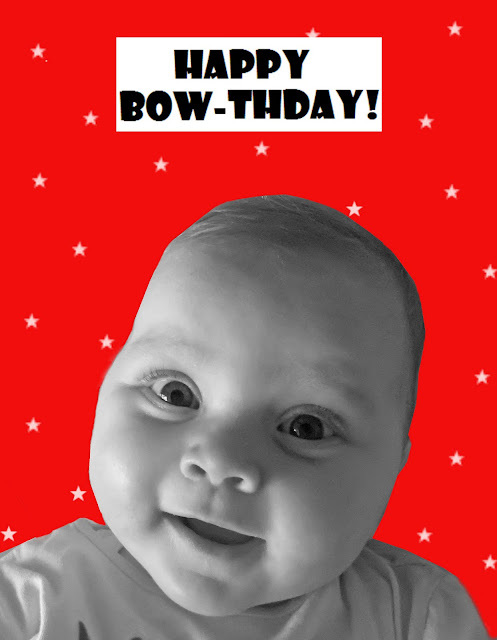 If you decide to do the latter, leave a bit of headspace above your subject's head so the bow fits on the card. (Oops, I'm sounding a bit gender-bias and assuming your subject is a girl - sorry! If you have a boy-child, then leave enough room under his chin so you can position the brooch like a bow-tie). Then, if you have photoshop (like me), and know how to use it (unlike me), then you have all sorts of options on your hands. If not, see what you can do with Paint. 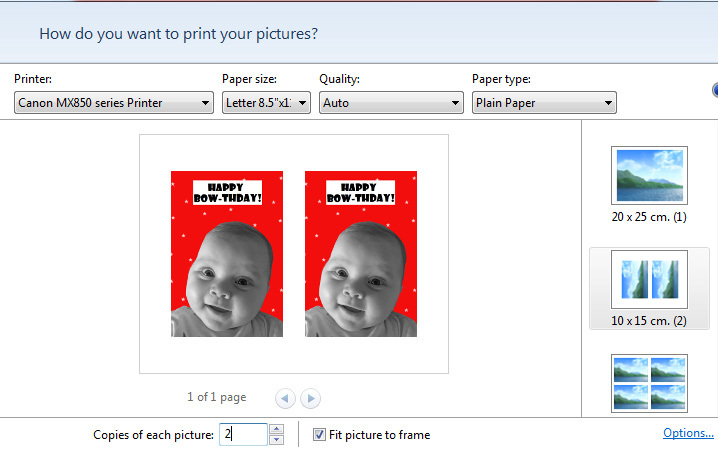 Print out your pictures. If you like, do a draft copy first to make sure your happy with how it looks (the actual printed picture can sometimes look a lot different to how it appears on screen). 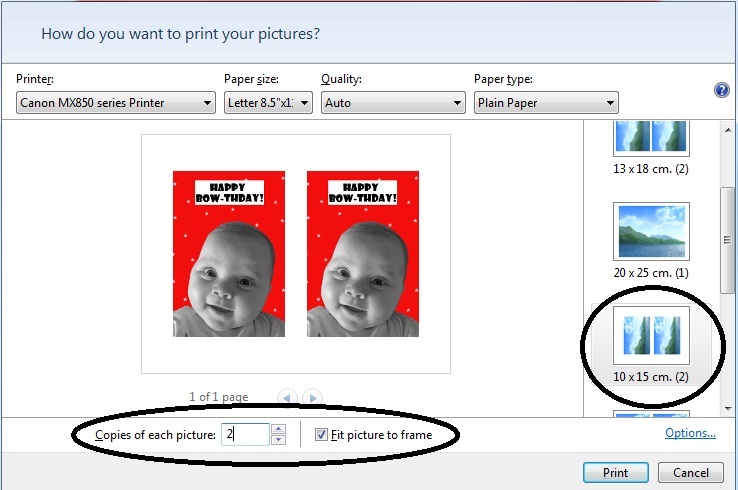 I print mine postcard size, 6 inches by 4 inches, two to a page. Make sure you check the 'fit picture to frame' box. Work out where you want to position the bow brooch on your card. Place the pin of your brooch in position against the card and mark in pencil where you will make two holes, about 1 cm apart. Poke a dressmaking pin through the marks you made and using these pin-holes as a guide, reinforce this area on the rear of the card with sello-tape. You can also reinforce the front of the card with sellotape too, if you like. Which is probably a good idea, to prevent tears. Yeah, do that then. 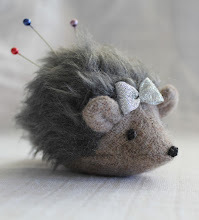 Again, poke your pin through the (now taped up) pin-holes again, and then find your self a larger needle, like a bodkin, and carefully pass this through the pin-holes to make a larger hole. Ouch. 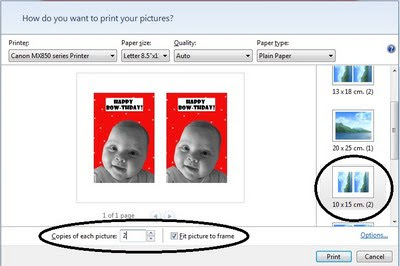 Measure a nice even border around your photographs, and then cut, using straight- or fancy-edge scissors. Erase any pencil lines you made when ruling the border (carefully if you used fancy scissors because those edges can be reeeally delicate). And then carefully pin your brooch on (roll the card slightly to help you pin it on, don't fold it!) Awww, sweet! Even if the recipient of the card is not a bow or brooch kind of person, they can leave the pin intact and keep the card as a 3D type of picture. But, if they want to use the brooch, they still have a lovely photo/card as a keepsake. 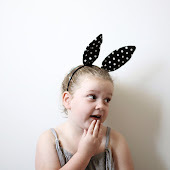 In addition, the bows are inexpensive to make, the card is personalised and cheap to whip up, and they hardly cost anything to post, which makes them a great gift idea for interstate friends. And overseas relatives that live far, far, FAR away. Geez, I wish I had some of those. Really cute idea, this would be perfect as a gift!